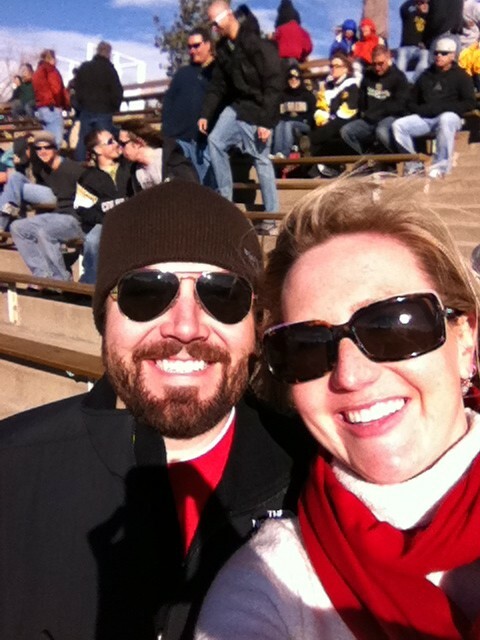 We spent this past weekend in Colorado visiting friends from law school and going to the UofA v CU Boulder game. In a word, it was awesome. When the PAC 10 became the PAC 12, PW began dreaming of snowy football games in CO. And when this season’s schedule was announced, he began putting together plans for a road trip. We get a double bonus for trips to Denver because our friends, Brian and Jeanne are now Denver-ites which means we got to see and catch up with them too. And catch up we did. Friday night was spent laughing, reminising and filling each other in on life, jobs and the kiddo. We talked over the most amazing meal ever at Osteria Marco. We also walked around Larimer Square – it felt like the perfect holiday location; strings of lights, chilly weather and a warm coat! 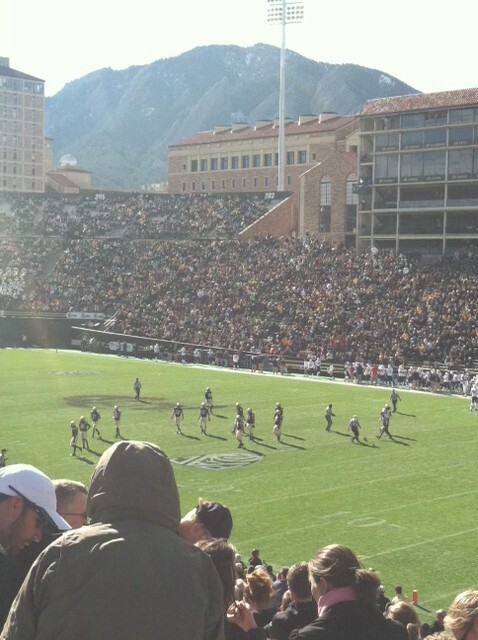 After a delicious, greasy spoon cafe breakfast, we headed West to Boulder for the game. Colorado is spectacularly beautiful and getting to go to a small college town made me think of Tucson. 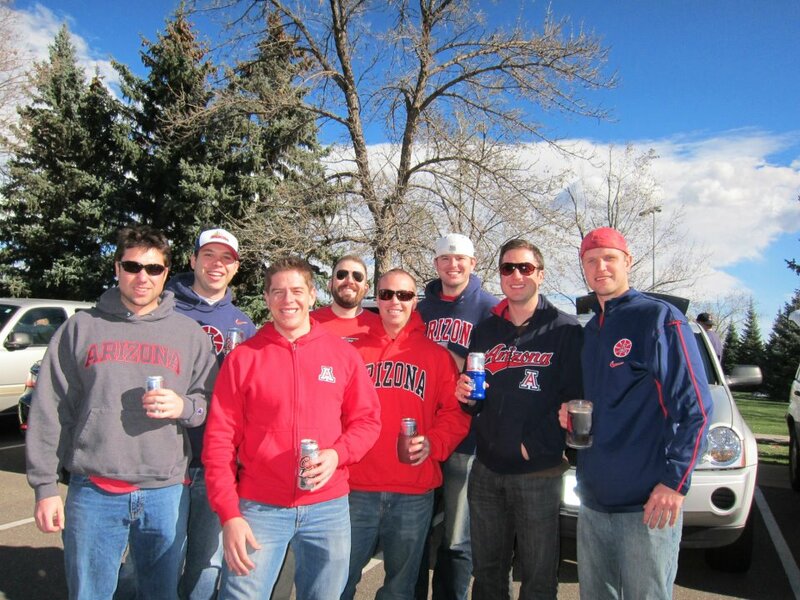 We arrived to join the UofA tailgate hosted by a group of friends and PW’s fraternity brothers. It’s always nice to know that some things don’t change. To sum up the game…it was horrible. The wind was blowing at a steady 40mph and gusting up to 70mph. Worse, UofA was crushed by Boulder (maybe the only team that was worse than the Cats). But the scenery and the company made up for all of it. 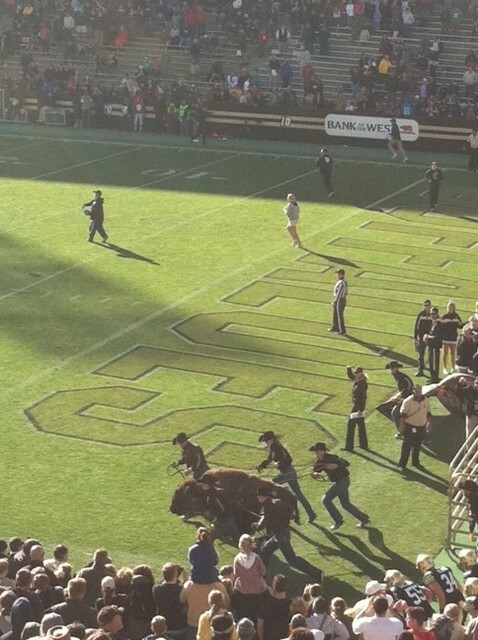 Not to mention the super cute cowboys on the field that were incharge of running Ralphie the Buffalo down the field. Seriously, check out my hair in the wind! Who runs a real buffalo around?? Saturday night we ordered pizza and opened several bottles of wine and warmed up at Brian and Jeanne’s house. After several sips, Brian agreed to break out the guitar and play. He can literally play anything. He has a huge book of lyrics so that everyone can accurately sing along – and it’s something we did often when we were all broke law school students (or just broke because we were married to a student). It reminded of one of my favorite memories – it was maybe a week before we were moving home to AZ. I had cut out of work early to meet PW, Brian, Jeanne and our other friends James and Tess (Brian and James were roommates at the time). I found them all sitting on the “patio” of the row “house”James and Brian rented (I say “house” because their slum lord probably had the house condemned the minute the tenants moved out), drinking and singing Toto’s “Africa” with total seriousness on their faces. There was no making fun of Toto, it was serious music to be taken seriously. The weather was finally warm, the beer was cold and we sat and sang and drank until it was time to catch the last metro home. It was the perfect way to say goodbye to the city, our friends and to being a student. Flash forward 4 years, weddings, kids, jobs and many miles traveled later and we were right back to that point. We sat and sang until we realized that we had to get up in just a few hours to catch our plane. And much like I am an amazing dancer after several cocktails, I am also an amazing singer. Sadly for you, WordPress won’t let me upload the voice memo I took of the Billy Bragg and Wilco California Stars jam session. You’ll just have to imagine the awesomeness in your mind. A thousand thank you’s to Brian and Jeanne for being such sweet hosts and amazing friends. I see reunion 2012: Spring Training in our future!